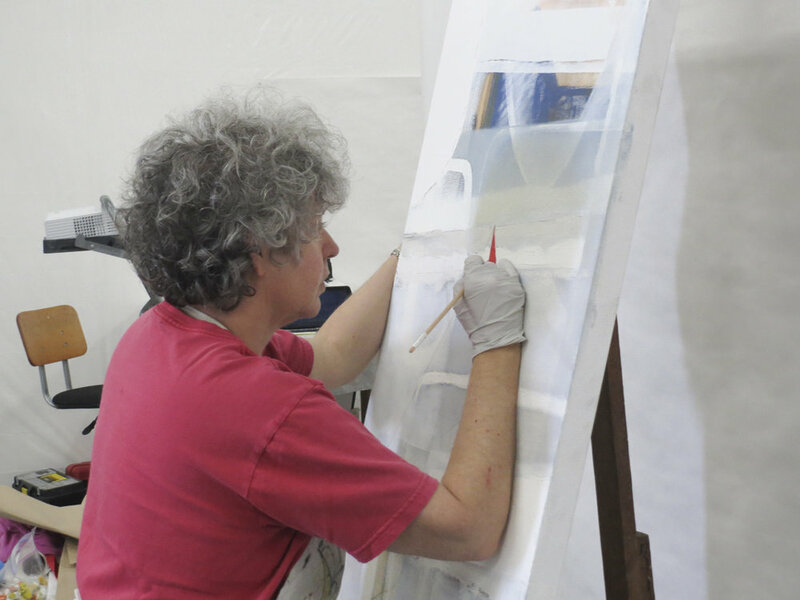 Tom Wudl has more than thirty years experience teaching painting and art history at most of the major universities and art schools in Southern California. For over twenty years, he has been offering private instruction at his studio. Students come from varying backgrounds. Some have had considerable exposure to art; in some cases they may have completed BFA or MFA degrees, and seek to deepen their experience. Others may have wanted to paint or make art all their lives but have not had an opportunity to do so for a variety of reasons; they may have had obligations that have prevented them from doing so or they may have felt incapable or unqualified to pursue this dream. All experience levels are welcome. Also offered are private tutoring or mentorship for artists who may have special needs; artists who cannot attend the studio classes; or, non-local students (via Skype). Private consultations are available on an “as needed” basis. Tuition is $500 monthly. 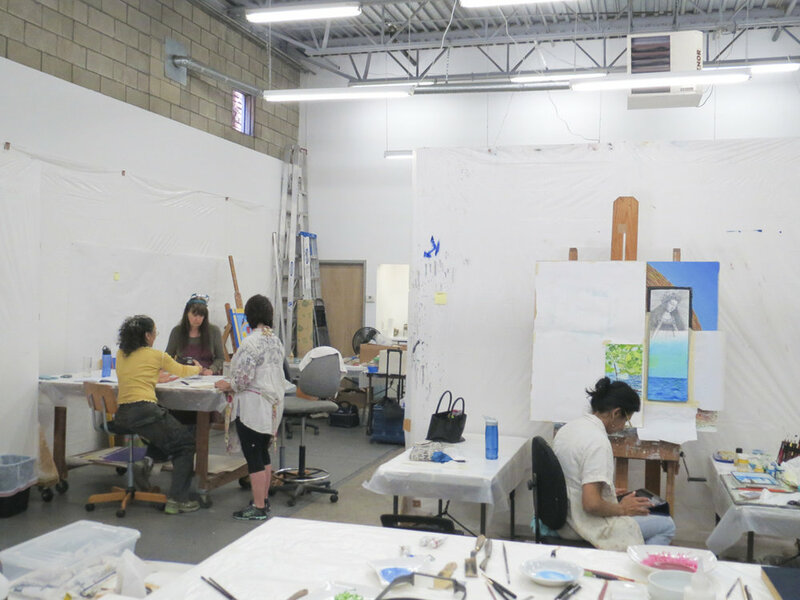 Studio classes meet once a week for six hours from 10:00 am to 4:00 pm. There is no set curriculum. Everyone works at their own pace on their own projects with instruction tailored to the individual. For a glimpse into Tom's philosophy, here is an audio interview from early 2014 by Antrese Wood, a former student, for her Savvy Painter podcast (saavypainter.com). They discuss his approach to art making as well as his thoughts on the creative process. I've worked with great teachers at wonderful academic institutions where I gained skills, sensibilities, and an understanding of art history. However, it was not until I worked with Tom Wudl in his studio that I was able to commit to being an artist and find my voice. It started with breaking through fear. Tom uses many techniques to help me move through my stuck points. Even more powerful is his ability to be present and pick up what I like to call “things on the periphery of my consciousness.” He calls attention to my intuitions, which I might otherwise disregard or take lifetimes to recognize. Tom encourages me to push myself out of my comfort zones. And with his extensive and deep knowledge of the arts, Tom provides meaningful context. Working in the Wudl Studio gives me an opportunity to connect with serious and supportive artists. We all work independently, yet there is synergy. It is a quiet space where I can focus and concentrate, and an enclave percolating with energy and ideas of artists who support and inspire each other. Exchange of ideas, visual stimulation, emotional support, and the flow of energy is all part of the mix. He believes that I am creative. He believes we are all creative. He wants to make me the best artist I can be.He does. He tells me not to compare myself to others. I try. When I cry when I am talking to him about my art he tells me that tears express something nothing else can describe. He tells me when my work is good. He tells me when my work is contrived. He believes that if I am engaged in trying work out what I am trying to do, then whoever is looking at my art will be similarly curious. Tom Wudl brings to his classes far more than instruction in technique, although he can and does provide that upon request. 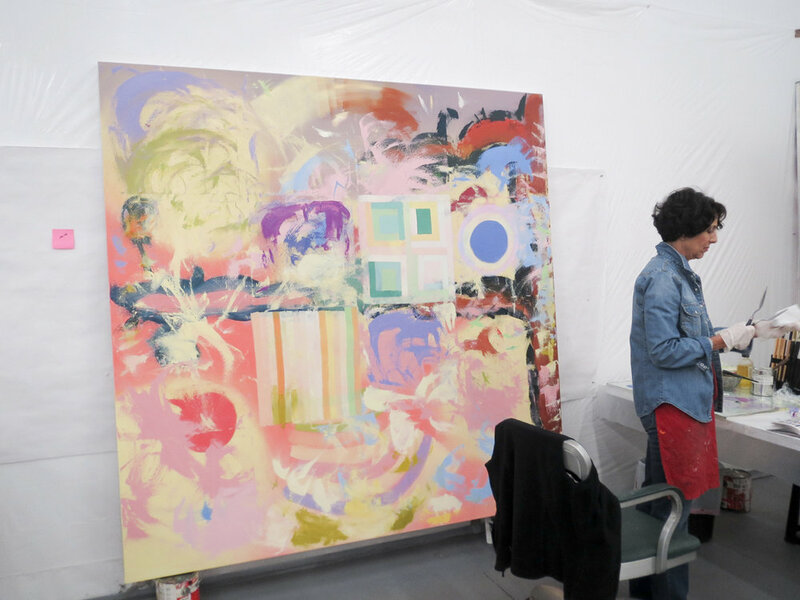 With an extraordinary breadth and depth of knowledge about art history, practice, and philosophy, Tom gives to each individual student whatever his work requires at any given moment. He is an inspirational teacher, mentor, role model and - sometimes - gadfly. I feel very lucky to have studied with him for the past fifteen years and look forward to what the next fifteen may bring. A year and a half ago I was introduced to Tom Wudl's class. Having never painted before or done anything I considered artistic, I was at the point in my life where I wanted to "explore my creativity." Working with Tom has been the most amazing experience on many different levels. Not only have I opened myself to totally new experiences and surprised myself with what I'm capable of, but I have so enjoyed the intellectual process that has accompanied the "artistic experience." My favorite day of the week is Thursday, where I am so fortunate to spend the day in this wonderful, safe environment, receiving support and encouragement from Tom as well as the other students in the class. I can truly say that this experience has helped me to be a freer individual. Working with Tom Wudl, and being a part of his studio community, has demonstrated for me how to ride my creativity rather than work against it. Sharing from his own struggles and successes, he is able to model the ways to confront and disarm the always lurking misgivings. In his teaching he is erudite, impassioned, honest, articulate, generous, humorous, encouraging, understanding, patient, demanding, accessible, inclusive . . . and he fosters a community in which it is safe to take the risks which must be taken. Tom Wudl is a magnificent guide and teacher, and a treasure. PROSPECTIVE STUDENTS PLEASE CALL OR EMAIL THE STUDIO TO MAKE AN APPOINTMENT. 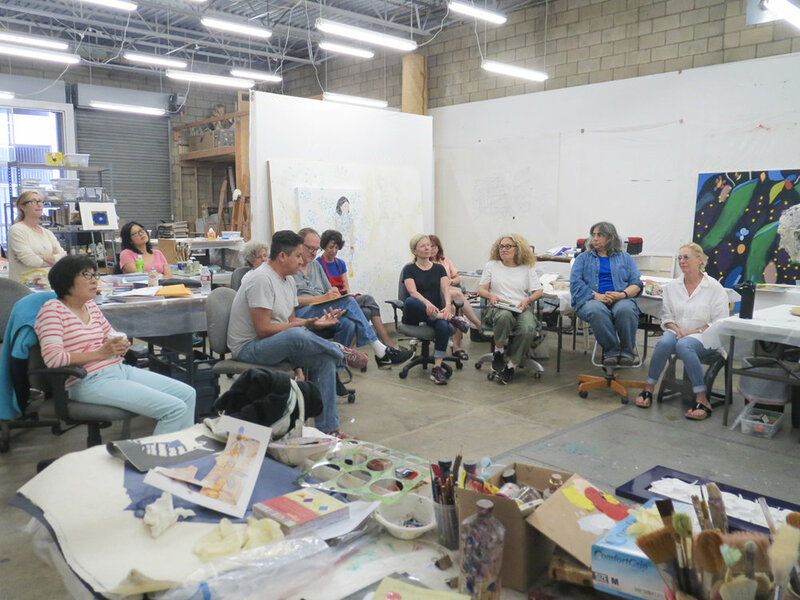 The studio is located in downtown Los Angeles, within walking distance to Little Tokyo and the Geffen Contemporary at MOCA.